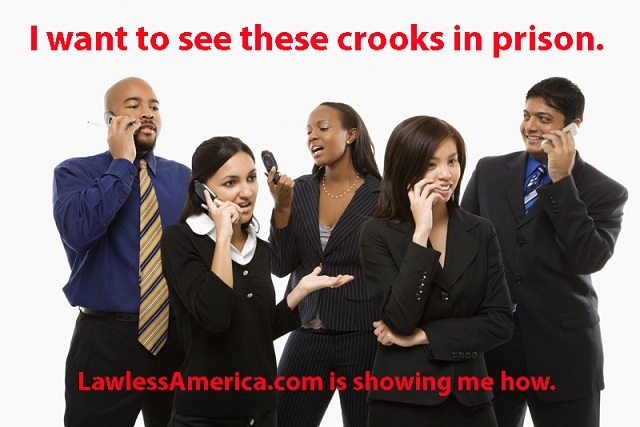 Lawless America friends will be filing criminal charges against corrupt judges, attorneys, government officials, and others the week of June 3, 2013. This is a date change from May 1 as folks wanted more time. We are moving the date to June 3 as many people have asked for additional time to prepare, and I was not able to devote adequate time to helping people the last several weeks. The 5th Amendment to the U.S. Constitution says in part as follows: "No person shall be held to answer for a capital, or otherwise infamous crime, unless on a presentment or indictment of a Grand Jury...."
With a presentment, the charges originate in the grand jury. The grand jury discovers an offense on its own. It observes and collects evidence of the offense, and the government has nothing to do with it. The grand jury is independent. The court then prepares the indictment based on the presentment. This is a way for the PEOPLE to address judicial corruption. The government would normally try to block an effort such as this, but you need to use the techniques that I developed in my efforts to have the best chance of success. There are two grand juries -- county or state and federal. You should try to reach both. There is a federal statute that requires U.S. Attorneys to submit your information to the Federal Grand Jury..
(a) It shall be the duty of each such grand jury impaneled within any judicial district to inquire into offenses against the criminal laws of the United States alleged to have been committed within that district. Such alleged offenses may be brought to the attention of the grand jury by the court or by any attorney appearing on behalf of the United States for the presentation of evidence. Any such attorney receiving information concerning such an alleged offense from any other person shall, if requested by such other person, inform the grand jury of such alleged offense, the identity of such other person, and such attorney's action or recommendation. Here's a link to the Department of Justice website where you can find your U.S. Attorney. Note that the statute says "any attorney" appearing on behalf of the United States. This means that you could send your information to any Assistant U.S. Attorney. Perhaps they will not be as quick to commit a felony as the U.S. Attorneys have demonstrated to be a practice. 200*200 Neal Schwarzfeld, Schwarzfeld, Ganfer & Shore, New York City, for Bandler & Kass, Robert Sylvor and William J. Werner. Russell, Piccoli, Phoenix, Ariz., Herbert C. Ross, Jr., Rogers Hoge & Hills, New York City, for plaintiffs. It shall be the duty of each such grand jury impaneled within any judicial district [special grand juries impanelled pursuant to 18 U.S.C. § 3331] to inquire into offenses against the criminal laws of the United States alleged to have been committed within that district. Such alleged offenses may be brought to the attention of the grand jury by the court or by any attorney appearing on behalf of the United States for the presentation of evidence. Any such attorney receiving information concerning such an alleged offense from any other person shall, if requested by such other person, inform the grand jury of such alleged offense, the identity of such other person, and such attorney's action or recommendation. At the outset, I would point out that plaintiffs do not seek to compel the U.S. Attorney to prosecute the named defendants. Rather, they seek to have either the court or the United States Attorney present certain information to the grand jury. This distinction is critical because almost the entirety of the opposition to plaintiffs' motion is based on the mischaracterization by the U.S. Attorney and the other defendants of plaintiffs' motion as one seeking to compel the U.S. Attorney to initiate proceedings against the other defendants. Thus the U.S. Attorney argues that plaintiffs lack standing to bring this suit because "a private litigant lacks a sufficiently distinct interest in a criminal prosecution to compel its initiation." Govt. Memo at 7, citing Linda R.S. v. Richard D., 410 U.S. 614, 619, 93 S.Ct. 1146, 1149, 35 L.Ed.2d 536 (1973); see Leeke v. Timmerman, 454 U.S. 83, 86-87, 102 S.Ct. 69, 70-71, 70 L.Ed.2d 65 (1981); Heckler v. Chaney, ___ U.S. ___, 105 S.Ct. 1649, 84 L.Ed.2d 714 (1985) and other cases. He argues that because presenting the information to the grand jury might not lead to an indictment, or conviction, or ultimately to an award in the plaintiffs' pending civil action, plaintiffs' interest is too attenuated from the relief sought to justify allowing them to bring the instant action. "Congress may enact statutes creating legal rights, the invasion of which creates standing, even though no injury would exist without the statute." Linda R.S. v. Richard D., 410 U.S. 614, 617 n. 3, 93 S.Ct. 1146, 1148 n. 3, 35 L.Ed.2d 536 (1973). See Warth v. Seldin, 422 U.S. 490, 500, 95 S.Ct. 2197, 2206, 45 L.Ed.2d 343 (1975); Trafficante v. Metropolitan Life Ins. Co., 409 U.S. 205, 212, 93 S.Ct. 364, 368, 34 L.Ed.2d 415 (1972) (White, J., concurring); Hardin v. Kentucky Utilities Co., 390 U.S. 1, 6, 88 S.Ct. 651, 654, 19 L.Ed.2d 787 (1968). When determining whether a plaintiff has standing, I need only examine the complaint to see if the plaintiff has alleged that he has suffered a cognizable injury. Nash v. Califano, 613 F.2d 10, 14 (2d Cir.1980). 18 U.S.C. § 3332(a) creates a duty on the part of the United States Attorney that runs to the plaintiffs, and the breach of that duty gives the plaintiffs standing to seek its enforcement. The defendants contend that "the decision to prosecute is the exclusive prerogative of the Executive Branch." Govt.Memo at 10, citing United States v. Nixon, 418 U.S. 683, 94 S.Ct. 3090, 41 L.Ed.2d 1039 (1974); Nathan v. Smith, 737 F.2d 1069 202*202 (D.C.Cir.1984); Inmates of Attica Correction Facility v. Rockefeller, 477 F.2d 375 (2d Cir.1973); Powell v. Katzenbach, 359 F.2d 234 (D.C.Cir.1965), cert. denied, 384 U.S. 906, 86 S.Ct. 1341, 16 L.Ed.2d 359 (1966), and other cases. They characterize plaintiffs' complaint and motion as attempts to compel the U.S. Attorney to prosecute the other named defendants, and, relying on the above cited cases, argue that courts have uniformly denied such relief. But no case cited has considered the requirements imposed by 18 U.S.C. § 3332(a). The only opinion I have found that even indirectly deals with the issue presented in this case is Judge Bork's concurring opinion in Nathan v. Smith, 737 F.2d 1069 (D.C.Cir.1984). The Attorney General shall conduct an investigation pursuant to the provisions of this chapter whenever the Attorney General receives specific information that any of the persons described in subsection (b) of this section has committed a violation of any Federal criminal law other than a violation constituting a petty offense. It may be thought that neither the relief granted by the district court nor that sought by the plaintiffs falls within the principle of Executive control of decisions to prosecute. The district court ordered the Attorney General to initiate a preliminary investigation; the plaintiffs seek to compel an application for the appointment of an independent counsel. The distinction between these remedies and the [prosecutorial discretion] principle discussed above has no significance, however. The only purpose of the preliminary investigation under the Ethics Act is to enable a report to the special division of this court about the need or the lack of a need for the appointment of independent counsel. The preliminary investigation is thus the first stage of the prosecutorial process and the district court has undertaken to control that stage. Plaintiffs would have the district court control the next stage as well ordering the Attorney General to apply to the special division of this court for the appointment of an independent counsel. It is no answer to say that the courts, under either form of relief, would not control the final prosecutorial decision since that would be made by the independent counsel. There are at least two flaws in that reasoning. The first is that the principle of Executive control extends to all phases of the prosecutorial process. Thus, were this a case about an ordinary prosecution under a federal criminal statute, a plaintiff could not escape the principle discussed by demanding only an order that the Attorney General present facts to a grand jury but leaving the decision whether to sign any indictment to him. Second, if private plaintiffs have the legal ability to require an investigation of criminal charges, it is difficult to understand by what principle they could be denied a cause of action to compel the independent counsel to prosecute if that counsel had sufficient evidence to do so under the policies of the Department of Justice, which the Act requires him to follow. 28 U.S.C. § 594(f) (1982). If the execution of the laws is lodged by the Constitution in the President, that execution may not be divided up into segments, some of which courts may control and some of which the President's delegate may control. 203*203 It is all the law enforcement power and it all belongs to the Executive. It may be that answers can be given that avoid or modify these traditional views. No such answers have been offered in this case, however. Contrary to what Judge Bork stated, Congress has divided the execution of the law into segments, with the presentation of information to the grand jury concerning racketeering violations being an area where the prosecutor's discretion was explicitly removed. Judge Bork himself recognized that judicial opinion was not unanimous on this question. The portion of his concurrence emphasized above is a criticism of the decision of the Fifth Circuit Court of Appeals in United States v. Cox, 342 F.2d 167 (5th Cir.1965). In Cox a 4-3 majority held that a United States Attorney could not be compelled to sign an indictment returned by the grand jury, and that without his signature the indictment would have no legal effect. 342 F.2d at 172. A different 4-3 majority held, however, that the United States Attorney could be required to assist the grand jury by drafting an indictment in accordance with their wishes, even if he had no intention of signing it if it were voted a true bill. 342 F.2d at 181. Accord, Report and Recommendation of June 5, 1972 Grand Jury, 370 F.Supp. 1219 (D.D.C.1974). In other contexts, courts have acknowledged that prosecutorial discretion is not absolute. In Powell v. Katzenbach, 359 F.2d 234, 235 (D.C.Cir.1965), cert. denied, 384 U.S. 906, 86 S.Ct. 1341, 16 L.Ed.2d 359 (1966), the court stated: "[w]e will assume, without deciding, that where Congress has withdrawn all discretion from the prosecutor by special legislation, a court might be empowered to force prosecutions in some circumstances." This term in Wayte v. United States, ___ U.S. ___, 105 S.Ct. 1524, 84 L.Ed.2d 547 (1985), the Supreme Court stated that prosecutorial discretion is not "`unfettered.' Selectivity in the enforcement of criminal laws is ... subject to constitutional constraints." ___ U.S. at ___, 105 S.Ct. at 1531 (quoting United States v. Batchelder, 442 U.S. 114, 125, 99 S.Ct. 2198, 2205, 60 L.Ed.2d 755 (1979)). Thus, in establishing this presumption [of the unreviewability of agency action] in the APA, Congress did not set agencies free to disregard legislative direction in the statutory scheme that the agency administers. Congress may limit an agency's exercise of enforcement power if it wishes, either by setting substantive priorities, or by otherwise circumscribing an agency's power to discriminate among issues or cases it will pursue. Plaintiffs argue that the language of § 3332(a) is clear and unambiguous: "Any such attorney receiving information concerning such an alleged offense from any other person shall, if requested by such other person, inform the grand jury of such alleged offense, the identity of such other person, and such attorney's action or recommendation." They contend that the duty to present the information is mandatory. Defendants contend that use of such mandatory language is common throughout the criminal provisions of the United States Code and has often been held to permit the exercise of prosecutorial discretion. See Heckler v. Chaney, ___ U.S. at ___, 105 S.Ct. at 1657; Inmates of Attica Correctional Facility v. Rockefeller, 477 F.2d 375, 381 (2d Cir.1973) ("The mandatory nature of the word `required' as it appears in [42 U.S.C.] § 1987 is insufficient to evince a broad Congressional purpose to bar the exercise of executive discretion in the prosecution of federal civil rights crimes."). The resolution of this issue lies in an analysis of the legislative history of 18 U.S.C. § 3332(a). The jury would not be limited by the charge of the court but would have the right to pursue any violation of the criminal law within its jurisdiction. Citizens would be accorded the right to contact the jury, through the foreman, regarding any alleged criminal act. (b) It shall be the duty of each grand jury impaneled within any judicial district to inquire into each offense against the criminal laws of the United States alleged to have been committed within that district which is brought to the attention of the grand jury by the court or by any person. (c) No person shall be deprived of opportunity to communicate to the foreman of a grand jury any information concerning any such alleged offense or instance of misconduct. As Senator McClellan explained during the Hearings before Subcommittee No. 5 of the Committee on the Judiciary of the House of Representatives, Ninety-First Congress, Second Session on S.30 (hereinafter "House Hearings") (1969), Title I of S.30 "guaranteed a measure of independence" to the special grand juries it authorized. House Hearings at 82. When pressed by the chairman of the House committee on the "need for granting special grand juries almost complete autonomy from the Federal district court and the U.S. Attorney," Senator McClellan stated: "Congress has ample grounds for determining that a need exists for creation of special Federal grand juries with substantial independence of the prosecutor and court." House Hearings at 118. Although not the most controversial aspect of the Act, much comment both pro and con was elicited during the House and Senate hearings concerning the provisions of the bill concerning grand juries. The chairman of the House Committee on the Judiciary stated, "[w]ith reference to Title I[,] ... we have opposition expressed from the Judicial Conference of the United States[,].... the New York County Lawyers Association[,] ... the Association of the Bar of the City of New York[,].... the National Association of Counties—United States Conference of Mayors and the American Civil Liberties Union oppose Title I." House Hearings at 177-78. 205*205 Proposed section 3324(b) provides that "It shall be the duty of each grand jury impaneled within any judicial district to inquire into each offense against the criminal laws of the United States alleged to have been committed within the district which is brought to the attention of the grand jury by the court or by any person." This provision is a statutory recognition of existing case law holding that the inquisitorial powers of a grand jury are virtually unlimited and that the grand jury can initiate a case on its own and investigate any alleged violation of Federal law within its jurisdiction. See Hale v. Henkel, 201 U.S. 43 [26 S.Ct. 370, 50 L.Ed. 652] (1906); Blair v. United States, 250 U.S. 273 [39 S.Ct. 468, 63 L.Ed. 979] (1919); United States v. Hartke-Hanks Newspapers, 254 F.2d 366 (C.A.5), cert. denied, 357 U.S. 938 [78 S.Ct. 1385, 2 L.Ed.2d 1551] (1958); In Re Grand Jury Investigation (General Motors Corp.), 32 F.R.D. 175 (S.D.N.Y. ), appeal dismissed, 318 F.2d 533 (C.A.2), cert. denied, 375 U.S. 802 [84 S.Ct. 25, 11 L.Ed.2d 37] (1963); United States v. Smyth, 104 F.Supp. 283 (N.D.Calif.1952); United States v. Gray, [sic[*]] 187 F.Supp. 436 (D.C.D.C.1964). Consequently, we can see no objection to this proposal. Section 3324(c) provides that no person shall be deprived of opportunity to communicate to the foreman of a grand jury any information concerning any offense against the criminal laws of the United States alleged to have been committed within the district. Section 1504 of title 18, United States Code, presently makes it an offense for anyone to attempt to influence the action or decision of any grand or petit juror upon any matter pending before it by a written communication. This provision is apparently intended to make it clear that no violation of this section is committed by a person who merely communicates to the foreman of a grand jury any information regarding any offenses against the laws of the United States. This provision could well encourage wider public participation in the fight against organized crime and we, therefore, support it. In response to the many criticisms, the provisions of the proposed Act regarding grand juries were amended. During the House Hearings, Edward L. Wright presented the views of the American Bar Association, which were essentially embodied in the Act in its final form. The American Bar Association recommends that the proposed right of a private person be modified to require that information possessed by such person be channelled through the appropriate prosecutor, and further, that the prosecutor be required in all cases to communicate his action or recommendation thereon to the special grand jury. In suggesting this amendment, we are mindful of and are fully in accord with the well-established tradition of citizen complaints. We know that criminal justice should and must be everyone's concern, and we favor doing everything proper to encourage greater cooperation by citizens in the war against organized crime. On the other hand, we are equally cognizant that the proper role of the professional prosecutor in the United States has been steadily emerging. It is our belief that the prosecutor should properly be vested with the responsibility of professionally screening allegations of criminal misconduct. At the same time, we recommend that there be built into the process a safeguard that will require the prosecutor to give an accounting of his screening. Section 3332(a) makes it the duty of a special grand jury impaneled within any judicial district to inquire into Federal offenses alleged to have been committed within the district. As amended by the committee, alleged offenses may be brought to the attention of the special grand jury by the court or by any attorney appearing on behalf of the United States for the presentation of evidence. Any such attorney who receives information of an alleged offense from any person must, if requested by the person, inform the grand jury of the alleged offense, the identity of the person who conveyed the information, and his own action or recommendation. 2 U.S.Code Cong. & Adm.News, House Report No. 91-1549, 91st Cong.2d Sess. (1970) 4007 at 4015. Thus both the language of 18 U.S.C. § 3332(a) and its legislative history indicate that Congress intended to remove the prosecutor's discretion in deciding whether to present information to the grand jury. He retains discretion with respect to how he acts and what he recommends concerning that information. 18 U.S.C. § 3332(a) creates a right in every person to have information known by them concerning organized crime to be presented to the grand jury. It provides two ways for this to occur—either the court may bring it to the grand jury's attention or a United States attorney can. Plaintiffs have requested one or the other form of relief, in the alternative. In order to grant a request for mandamus a court must find: "(1) a clear right in the plaintiff to the relief sought; (2) a plainly defined and peremptory duty on the part of the defendant to do the act in question; and (3) no other adequate remedy available." Lovallo v. Froehlke, 468 F.2d 340, 343 (2d Cir.1972), cert. denied, 411 U.S. 918, 93 S.Ct. 1555, 36 L.Ed.2d 310 (1973). Plaintiffs have urged me to request the grand jury to hear their evidence against the defendants. Although a judge may present evidence to a grand jury both under common law, see O'Bryan v. Chandler, 352 F.2d 987 (10th Cir.1965), and pursuant to the language of 18 U.S.C. § 3332(a), I decline to do so. The legislative history of Section 3332(a) suggests that Congress envisioned the United States Attorney's office as the primary channel of information to the grand jury. In a busy district such as this, moreover, it is the United States Attorney and not the individual district judge who is familiar with, and in fact sets, the schedules of the grand juries which have been impanelled in the district. Any effort by myself to bring plaintiffs' information to the attention of a grand jury would necessarily be channeled through the United States Attorney. Since the United States Attorney has been requested to present certain information to the grand jury he must do so. I will not relieve him of a duty which Congress has seen fit to impose. 18 U.S.C. § 3332(a) imposes a "plainly defined and peremptory duty" on the part of the United States Attorney to present the plaintiffs' information concerning the alleged wrongdoing of the other defendants to the grand jury. When first presented with plaintiffs' information in February, the United States Attorney's Office declined to act. It cited its heavy caseload, the need to conduct its own investigation to satisfy internal policies and the need to obtain the approval of the Justice Department before proceeding, and concluded that the chances of commencing prosecution of the other defendants named herein before the statute of limitations ran in May were almost non-existent. The substantial work already done by plaintiffs' attorneys in preparing this case and the apparent willingness of the alleged victims to come forward and testify should greatly facilitate the investigation 207*207 of plaintiffs' allegations by the grand jury. Although the statute does not specify in what way the United States Attorney should present information to the grand jury, under the circumstances of this case and in the interests of efficiency and justice, I strongly urge the United States Attorney to allow plaintiffs' attorney, Mr. Piccoli, to appear before the grand jury as a witness. I note, in any event, that this order does not invade the realm of prosecutorial discretion. The statute requires that the information proffered by plaintiffs, and the identity of plaintiffs, be brought to the attention of the grand jury. This order requires no more. Plaintiffs' request for a writ of mandamus is granted. Plaintiffs have also included a request that I appoint "a special prosecutor as the Court's own representative for presenting the pertinent details of the criminal wrongdoing of [certain named defendants] to the Grand Jury for its consideration." They cite no statute or case law authorizing such relief but rely instead on the court's "inherent" power. The only statutes dealing with the appointment of special prosecutors by the court (now called "independent counsel") all relate to the Ethics in Government Act, 28 U.S.C. § 591 et seq., which is not relevant to this case. Plaintiffs have not briefed this issue. I do not believe the inherent powers of the court go so far. See Matter of Application for Appointment of Independent Counsel, 596 F.Supp. 1465 (E.D.N.Y.1984). See also Fed.R. Crim.P. 42(b). Plaintiffs also argue that the Sedima requirement of a prior conviction gives them a direct financial interest in seeking prosecution and therefore, standing. That argument fails because of the unfettered discretion of the government's attorneys in deciding whether to prosecute. Section 591(a) was amended in 1983 by Pub.L. 97-409 § 4(a)(1), which substituted "information sufficient to constitute grounds to investigate" for "specific information" after "the Attorney General receives." In light of the holding of Nathan where the court relied on the lack of "specific information" to deny mandamus, it seems apparent that the amendment to Section 591(a) was designed to make it clear that the decision to investigate would rest with the Attorney General who would have discretion to decide whether the information received constituted "sufficient ... grounds." In its final form the Act did not simply amend the United States Code provisions concerning grand juries but created new sections requiring the appointment of special grand juries in all judicial districts with over four million inhabitants. These special grand juries were to be devoted to investigating organized crime. They had all the powers of regular grand juries plus the explicit authorization to issue reports concerning either organized crime conditions in the district or malfeasance in office by a public official. [*] Editor's note: citation should be 87 F.Supp. 436 (D.D.C.1949). Tune in Sunday, April 21 or April 28, 2013 from 9 pm to 11 pm Eastern Time for the next TalkShoe shows discussing how all of this will be done.